September 1944, the Allies have invaded France and Peter Cotton, a freshly recruited British intelligence agent, is sent to Cadiz in Franco’s Spain. His mission is to find out what has happened to their agent there, who had been reporting on activity in the port but has gone silent, and to then shut down the office. Cotton arrives first in a sweltering Madrid, then journeys by train to Cadiz where he checks into a dilapidated hotel, is greeted by a local cop and a resentful vice-consulate, and discovers his quarry has been dead for some time, fished out of the sea. He starts to tidy up the affairs of the agent and close down the office, but gets drawn into investigating the circumstances of his death, all the time shadowed by the local cop who seems to taken a special interest in Cotton and his mission. It soon becomes apparent that the local agent was involved in more than simply tracking German supply roots. 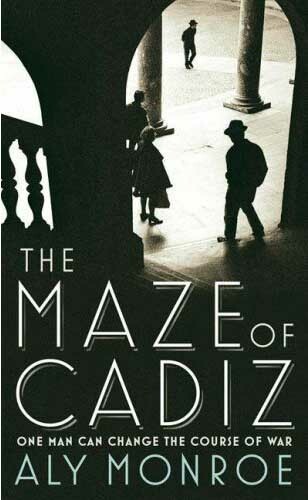 The first of the Peter Cotton series, The Maze of Cadiz is a spy tale in the Alan Furst mode - understated realism as opposed to a capital T thriller. Peter Cotton is a young ex-soldier sent to Cadiz on his first mission as a British agent. He’s somewhat naive, yet oddly worldly; independent and self-sufficient but a little lost in a foreign landscape haunted by civil war politics and conscious of the larger war going on around them and their fragile diplomatic position. Monroe does a good job of creating an atmosphere of sweltering heat, slow pace of life, and underlying political tensions and poverty, in the process evoking a well realised sense of place. The prose is nicely written and evocative. However, whilst the first third of the story is engaging, the unfolding of the plot is overly linear and lacks tension and intrigue, and it’s not clear why Cotton has been sent on a mission that is clearly more suited to someone with more in-field experience and knowledge of Spain, or a small team. Moreover, the characterisation is quite thin beyond Cotton and Raminez, the local cop, who adds a bit of colour. The result is a tale of where the reader is firmly placed in Cadiz, but does not quite fully believe what is happening there. Nonetheless, it’s an enjoyable read, due mostly to its atmospherics and prose. This one's on the pile to read, but I had seen some mixed reviews for it. Still not in a mad rush to get to it, but sounds interesting enough.